Seven volunteers with Nassau County Police Activity League were recently honored at NCPAL's Get in the Game Gala. Hicksville, NY - May 27th, 2015 - Seven outstanding volunteers with the Nassau County Police Activity League were named to the non-profit organization’s 2015 roll of NCPAL Heroes before a capacity crowd of 250 people at the Inaugural NCPAL “Get in the Game” Gala held on May 1 at the Coral House in Baldwin. “These volunteers have set themselves apart with their exceptional service and long-term dedication to their individual units, the youths who comprise the units and their commitment to the Police Activity League philosophy that ‘it is better to build youths than to mend adults’,” said Nassau PAL President Frank DiVittorio. 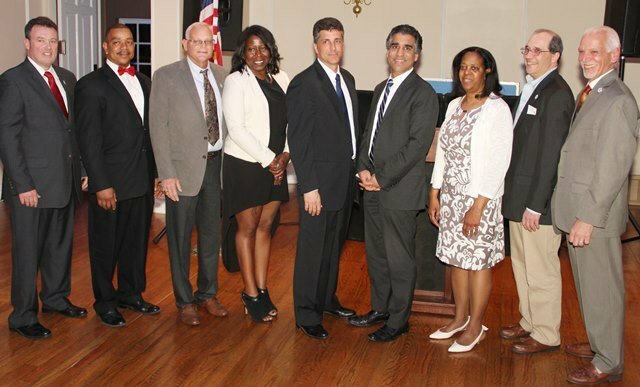 The honorees include Sunil Sani of the Great Neck PAL; John Bentrewicz of the Hicksville PAL; Roy Vasile of Merrick PAL; Charles Durrant of the Oyster Bay/ East Norwich PAL; Quontinett Simmons of the Roosevelt PAL; Michele Newell of Uniondale PAL; and Merrick resident Harvey Pollack of the Special Needs Unit PAL. The seven volunteer honorees participated in the filming of a special video presentation focusing on the impact NCPAL has had in their communities and their personal lives and which made its premiere at the Gala. Each of the honorees also received citations from Hempstead Town Supervisor Kate Murray for their volunteer efforts, contributions to their communities and work with youth on and off the athletic fields. A presentation was also made to Honorees Karen and John Acompora for the work of the Louis J. Acompora Memorial Foundation, which is dedicated to improving sports safety and which focuses on the placement of AEDs in all schools, public venues and youth athletic organizations. In October 2014 Karen Acompora presented a $10,000 grant to the NCPAL for its AED program which includes maintenance of 132 onsite AEDs, free AED training programs for volunteers and officials and the purchase of new AEDs. To see photos from the Gala, please click here. For more information about Nassau County PAL youth sports and other programs or to inquire about volunteering with NCPAL, please visit www.nassaucountypal.org. Nassau County Police Activity League (NCPAL), founded in 1940, is a tax-exempt, not-for-profit organization that operates twenty-nine (29) local units, which cover over forty (40) different communities in Nassau County. An executive board, a board of trustees and thousands of volunteers carry out the organization’s mission each day. NCPAL offers programs for over 20,000 young people from across Nassau County. The NCPAL mission is to prevent juvenile delinquency and steer children clear of gang activity, and to aid in the positive interaction of Police Officers and youth. The Nassau County Police Department provides officers to oversee these units and to interact with the youths of these communities. Activities that are offered include sports, crafts, educational, and other programs. These activities vary from unit to unit and are based on the local community needs and interests. For more information about NCPAL, please visit their Facebook Page, or visit www.nassaucountypal.org. Pictured at the Nassau County Police Activity League 75th Anniversary "Get in the Game" Gala from left to right are: NCPAL Commanding Officer Sgt. Doug Kenah with Honorees Charles Durrant, Harvey Pollack, Quontinett Simmons, John Bentrewicz, Sunil Sani, Michele Newell, Roy Vasile, and NCPAL President Frank DiVittorio. Subject: LongIsland.com - Your Name sent you Article details of "Nassau County Police Activity League Honors Seven “PAL Hero” Volunteers at 2015 Inaugural Gala"